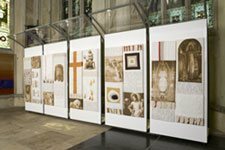 Deo Gloria Trust has 12 textile exhibitions for use in Cathedrals and greater churches. See here for more details. The Gospel of Luke in a magazine with explanations, life stories, Q&As and further reading and investigation through Christianity.org.uk. Click here to find out more. The nationwide Christian follow-up service Contact for Christ has now been operating for over 40 years. Find out how your church can be a part of it here.